In the Beginning, the Creator fashioned the world via a series of divine words. These words were then written in letters of fire upon a series of celestial tablets called the Book of the Speech From God. That Book contains the celestial language of creation, the keys to the gates of heaven and all the knowledge and wisdom of the universe—past, present and future. It appears in many different forms in religions around the world—variously called the Heavenly Tablets, the Tablets of Destiny, the Book of the Secrets of God, the Book of Life, the Book of the Lamb, the Book of Thoth, the Akashic Records, and even Book T (or Tarot). In the Garden of Paradise, Adam fluently spoke the celestial language recorded in the Book. With it, he held familiar conversation with both God and angels and also gave true names to all created things. However, when Adam lost his place in Paradise, he also lost his knowledge of the sacred tongue—he could no longer easily speak with the angels. However, so he might communicate with his family, he created a primordial human language based on his best (yet flawed) memories of the celestial speech. Seven generations later, the prophet Enoch established a new dialog with the angels. The holy creatures deemed him worthy to visit the heavens, to see the choirs of angels, the Throne of God, and the celestial tablets. From them, Enoch transcribed 366 earthly books of wisdom, with which he hoped to restore humanity to its former glory. But, alas, Enoch’s wisdom was soon lost in the Great Deluge that destroyed the world. Adam’s reconstructed language persisted (through Noah’s line) until the Confusion of Tongues at the Tower of Babel. There, the primordial human tongue was divided into several different languages so the builders of the Tower could no longer communicate with one another or complete the project. (This is the Biblical explanation for the various languages of the world.) Of all the ancient tongues, the one that remained closest to Adam’s original was the one we know today as Biblical Hebrew. No knowledge or memory of the celestial tongue of the angels survived at all. Then, in the late 1500s, a new pair of prophets—Dr. 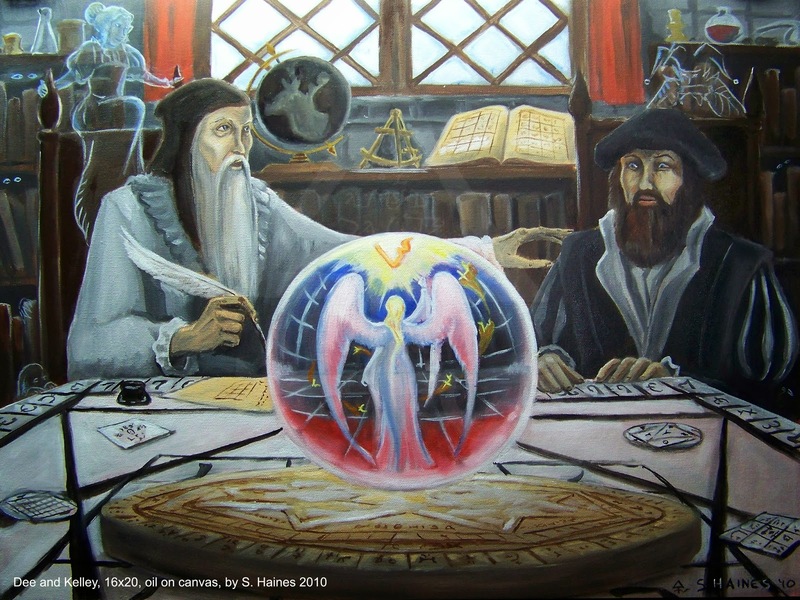 John Dee and his “skryer Edward Kelley—took a keen interest in both angels and their lost language. Working, at first, from various Solomonic grimoires, these men established contact with the same angels to whom Enoch had once spoken. They revealed many magickal secrets to the two men, such as how to summon the angels of the planets and the stars, how to descry the secrets of foreign nations, and how to—like Enoch—spiritually visit the celestial realms. Most importantly, Dee also asked the angels to reveal the lost Book of Enoch—by which he meant an apocryphal Biblical text that preserves the story of Enoch’s life and work. (Today, this text is called 1 Enoch or the Ethiopic Book of Enoch. Though it was lost in Dee’s time, it was rediscovered in the 17th Century. You can now find it online in many places for free.) The angels agreed to Dee’s request; however, what they brought was not the Biblical text at all. 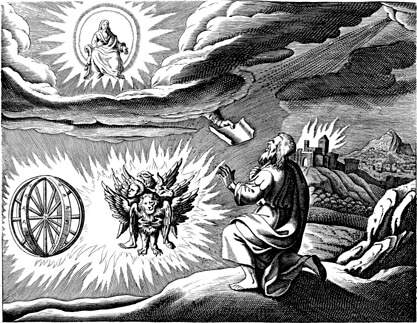 Instead, they revealed the celestial tablets—the Book of the Speech from God—from which Enoch had once copied. To Edward Kelley the Book appeared as a large tome of forty-nine leafs, written in blood (we assume the blood of the Lamb, as mentioned in the Book of Revelation) and containing the forty-nine speeches God had used to create the world. The angels told Dee and Kelley how to use the Book to open the gates of heaven, receive revelations directly from God, and to speak with angels in their own native tongue. Though Dee never called it such, later historians would refer to Dee’s material as “Enochian Magick,” due to its relationship to the biblical prophet Enoch. This complex system of magick remained largely hidden in Dee’s journals for hundreds of years. The Order did not originally know about Dee’s planetary magick, nor did they have access to the most important aspect of his system—the Book of the Speech From God. They did have his systems for skrying various locations around the world and for summoning the angels of the stars. They also had a series of 48 invocations in the Angelical language (often called Keys or Callings) that were intended to access the powers of the celestial Book, but they did not know the true purpose of the 48 Keys. The Golden Dawn also interpreted the angels of the Watchtowers as creatures of the four Elements: Fire, Water, Air, and Earth. 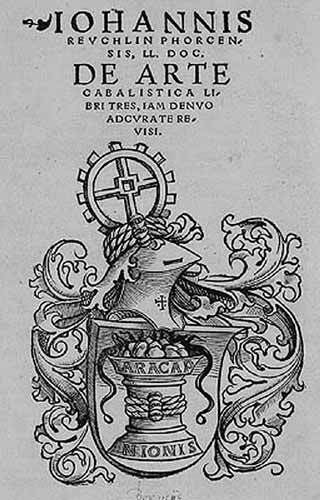 (Dee never associated his Watchtowers with the Elements, instead assigning them only to the four cardinal directions and listing the functions of the angels as mostly alchemical in nature.) Finally, because they did not know of the Book of the Speech From God and its magickal system, the Golden Dawn assumed the Angelical Keys should be used to summon the angels listed in the Watchtowers. Therefore, they divided the Keys and applied them to the various groups of angels found throughout the squares. These things—the different arrangement of Watchtowers in the quarters, the new manner of decrypting the names, the application of the four Elements to the Watchtowers, and the use of the Angelical Keys to summon the Watchtower angels—are the very things that make Golden Dawn Neo-Enochiana a completely different tradition from Dee’s original. 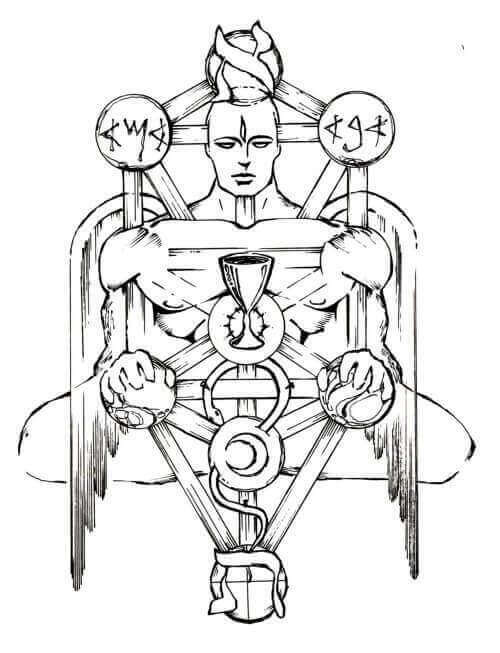 Beyond this, the Order devised a deeply complex system for applying their own correspondences to each and every Watchtower square, along with their own rituals for working with the angels. Over the next hundred years, the Golden Dawn would have the largest impact on the modern occult revival, and thus their Neo-Enochian system would become the common standard. Every bit of this system is unique to the Golden Dawn tradition, though many modern students mistakenly believe some of it originated with Dee. They do not know that there is a larger—and indeed complete—system of magick found throughout Dee’s collection of spiritual journals. Even those who are aware that more Dee material exists, do not often understand the fundamental differences between Dee’s magick and what was later taught by the Golden Dawn. In the late 1990s, the advent of the Internet brought about a new era of research and communication between scholars. Up to that point, the Dee material had been considered very obscure and hard to understand. Few had the courage to tackle the material by themselves. Now, however, Dee scholars and Enochian practitioners from around the world could finally pool their resources. Over the course of about a decade, Dee’s journals were fully vetted and his obscure magickal system finally pieced together again. At last, the Dee-purist study of Enochiana came to exist over a hundred years after the Golden Dawn’s recension had become standard. Today, it is not uncommon to see Dee’s Enochian magick discussed alongside the Golden Dawn’s as if they were one and the same. In fact, some intermixing is taking place—mostly on the part of Golden Dawn magicians borrowing further elements from Dee’s journals (such as his angelic summoning tools) and applying them to their Neo-Enochian rituals. You will not likely find such magicians changing the directions or Elemental associations of the Watchtowers back to Dee’s originals, nor are they likely to remove the Angelical Keys from their Watchtower invocations. Such changes would remove the Enochian system from the Golden Dawn cosmology such practitioners have adopted. The Dee-purists, on the other hand, are much less likely to adopt any aspect of the Golden Dawn Enochian material into their study or practice of the magick. Again, to adopt such changes would be to remove the system from the Renaissance cosmology they know. They stick with what is outlined in Dee’s journals as well as what is described in the grimoires that Dee consulted in his work (such as the Arbatel of Magic, Agrippa’s Three Books of Occult Philosophy, the Lemegeton, etc.). The usual mistake of the Dee-purist is not in misunderstanding the magick (or understanding it only in part), but in assuming that the Golden Dawn’s version is somehow “wrong.” While it is true that the Neo-Enochian system was created from an incomplete view of Dee’s material, that doesn’t make it inherently incorrect. At least, not any more so than the Golden Dawn’s Egyptian material is incorrect, or its Qabalah, or its Alchemy, etc. In all of these cases, the Order adopted aspects of older systems into their own unique framework, creating something new in the process. None of them are pure examples of the originals, but all of them fit into the greater context of the Golden Dawn tradition itself. 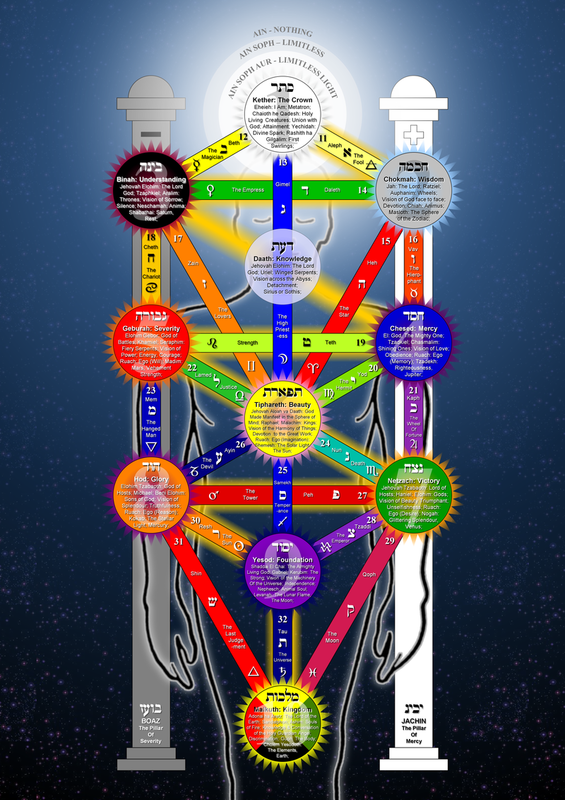 The Neo-Enochian system is “correct” from within the Golden Dawn (and those who followed in their footsteps, such as Thelema, Wicca, and others). But, then, the Dee-purist system is also correct in that it is an accurate reflection of what the man himself recorded. Over the past twenty years, a lot of great work has been done to decipher and restore Dee’s system. Much effort has been made to understand the Angelical language, the Book of the Speech From God, the various hierarchies of angels, and the magickal methods Dee recorded. This new material is only beginning to reach the occult community through forums, blogs, and published books. And students are only now beginning to gain an awareness of the differences between the two traditions of Enochian magick (or, in fact, that there are indeed two different traditions). For the first time in over a hundred years, genuinely new (yet older) Enochian material is becoming available for students, with more on the horizon. Without a doubt, this is an exciting time in the realm of Enochian study and practice.